Scoobies is a newly-launched Australian stationery brand with an array of colourful (yet functional) items that would make a perfect addition to your child's (and even your own) work-desk. 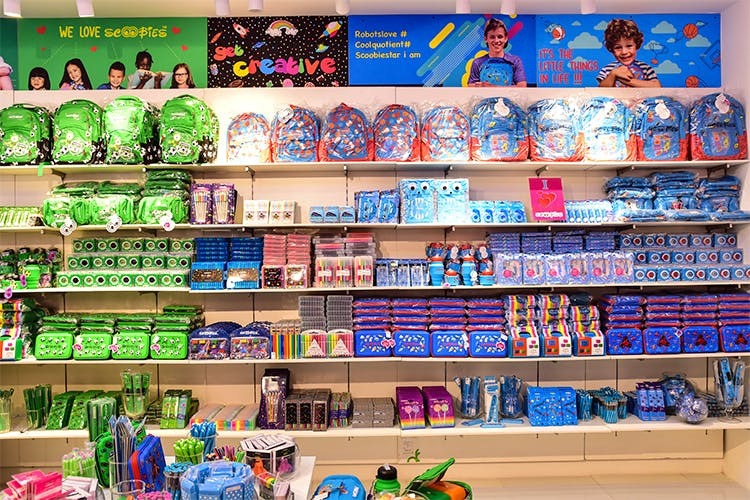 Located inside the DLF Mall Of India, this new stationery store made us feel like an excited kid who's been let loose in a place full of cool and funky stuff. The usual pencils, sharpeners, tape dispensers, bags, erasers and calculators have all been given a colourful twist that you (or your little one) won’t be able to help but show off. We love that everything is non-toxic, eco-friendly and the quality is super-reliable. We’re especially crushing on their stationery box, which has all the basic essentials (including owl pencils, rainbow gel pens, neon highlighters, 2-in-1 sharpeners and eraser, slap rulers, tape dispensers and cute badges). If you compare the prices of the products to their generic counterparts, you might find them a little overpriced. However, the quality is definitely good enough to make you want to splurge. Don't want to make the trip to Noida? You can buy their stationery box via LBB Specials.